Caerphilly Castle Of Cardiff is the most visited tourist attraction present in Wales, United Kingdom. This 13th-century castle was built by Gilbert de Clare. It is the second largest castle after “Windsor Castle” present in the United Kingdom. 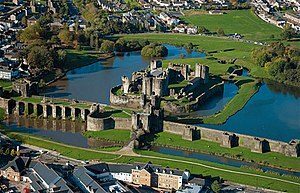 Caerphilly Castle is spread over 30 acres. The castle is surrounded by artificial lakes. It is also considered as one of the most elaborate water defenses in all Britain. This historic site is now maintained by CADW. CADW is the local Government’s historic environment service working for the well-protected historic environment for Wales, United Kingdom. Note: Children below 5 years receives free entry. Family price includes 2 adults and 3 children. Above-mentioned prices valid until 31 March 2018. Note: Public holidays may affect the timings. Last admission 30 minutes before closing. Caerphilly Castle remains closed on the 24, 25, 26 December and 1st January. Note: Public holidays may affect the timings. Last admission 30 minutes before closing. This is the second largest castle present in Britain. The construction was started in 1268 and completed in 1290. Pennant Measures material was used to construct this castle. It was built by Gilbert de Clare. The castle was attacked during the Madog ap Llywelyn revolt in 1294. In the 16th century, the surrounding artificial lakes had drained away. These lakes were re-flooded in 1950. This castle witnessed many important events such as Welsh Wars, Invasion of England and English Civil War. Major restoration project had been done between 1928 and 1939. More than 1,35,000 persons visited this place in the last year. This is also considered as one of the favorite filming location for British Movies and Television programs. The vehicle is provided for a disabled person. Smoking is prohibited in the castle premises.